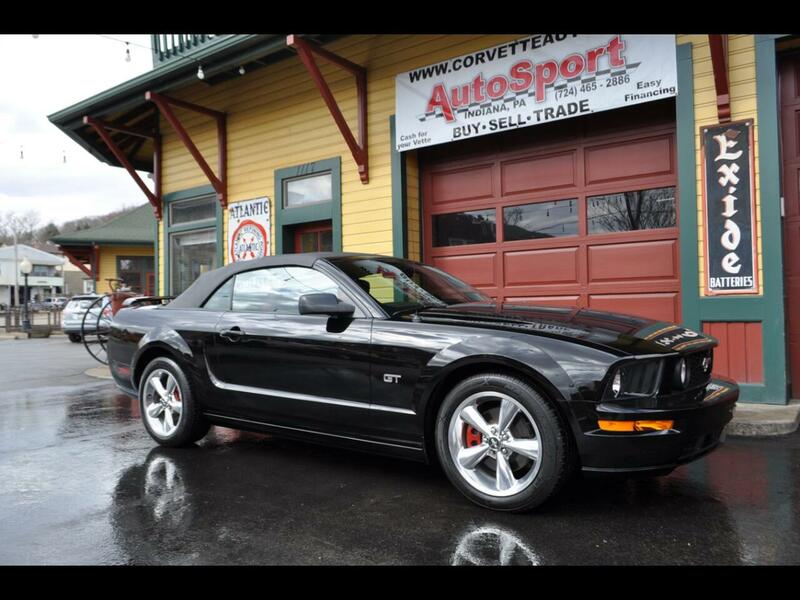 Used 2007 Ford Mustang GT Deluxe Convertible for Sale in Indiana PA 15701 AutoSport Co. Offered for sale is a Clean AutoCheck, 2007 Ford Mustang GT Convertible with 71k well cared for miles!! This Black Mustang GT is sure to impress with a 4.6L V8 engine paired with an automatic transmission allowing this car to be the perfect convertible. The black paint is in great condition with very minimal wear present for its age, likewise the premium 5-spoke wheels show great and give this Mustang a great stance. Throughout the smoke free, red leather interior there is only minimal wear present, with the dash area, carpeting and console area all showing excellent! The power convertible top functions properly with no lags or issues, and the fabric shows very well. In addition, this 2007 Ford Mustang GT Convertible with only 71k miles is equipped with options such as: Clean AutoCheck, 4.6L V8 Engine, Automatic Transmission, Premium Wheels, Shaker Stereo System, Heated Leather Seats, AM/FM/CD/AUX/SAT Player, Power Convertible Top, Current PA Inspections, Original Books, 2 Sets of Keys and much more!! For more information on this 2007 Ford Mustang GT Convertible feel free to call/text Alex at 724-840-3499. This car is located at our Indiana, PA location we accept trades and can help with financing options. Thank you for your interest!